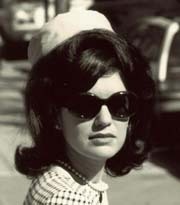 Pictured: Andrea Reese as Jackie O. New York, NY - Cirque Jacqueline, written and performed by Andrea Reese and directed by Charles Messina, is a revealing one-woman play about Jacqueline Kennedy Onassis. Following the suggestion of acclaimed director Jim Simpson, Andrea Reese combined her theatrical experience with extensive research on Jackie O. and a startling resemblance to the icon to create Cirque Jacqueline, a riveting drama. In Cirque Jacqueline, we meet the real Jackie who hid beneath a carefully constructed public persona. The play covers Jackie's childhood with a womanizing father and abusive mother, her joys and struggles within her marriage to Jack Kennedy, her trauma during and after the assassination, her scandalous marriage to Aristotle Onassis and her blossoming interests and loves during the last decades of her life. "Andrea Reese channels Jackie O. in this one-woman show. The upshot is a character of both charm and substance." channels the former first lady down to the last detail." but it's the quietly dignified solo act in the center ring that's most memorable." "Cirque Jacqueline is magnifique! A moving and most impressive performance." "Smart, lively and revealing. Reese helps us understand what made Jackie tick. This perceptive portrait is riveting theater." Cirque Jacqueline is directed by Charles Messina, whose credits include; Writer/Director of Mercury: The Afterlife and Times of a Rock God (Sanford Meisner Theater and The Triad Theater in NYC and The Art House/Provincetown, MA), Writer/Director of Actor Found Dead (John Houseman Theater, NYC), Writer of Spy The Movie, Director of Rockaway Boulevard (Lion Theater, Theater Row, NYC), Writer/Director of The Great Divide (The Triad Theater, NYC) and Director of The Accidental Pervert (The Triad Theater, NYC). Also in the play is the surprise non-speaking role of Dr. Max Jacobson. For more information on the show visit www.jackieoshow.com. Running time is 85 minutes with no intermission.